Dr. A. John Vartanian, a Los Angeles facial plastic surgeon, partnered with our medical website design firm to upgrade his current website. Throughout the process, our experienced team of writers, developers, and designers worked closely with Dr. Vartanian to create a customized, user-friendly, and informative resource for visitors. Along with comprehensive information on procedures ranging from rhinoplasty and facelift, to facial fat injections and BOTOX® Cosmetic, the new site has been implemented with the latest search engine optimization strategies intended to increase exposure and maintain a competitive ranking among plastic surgery websites in his online marketplace. Additionally, the site now features a responsive website design – an element enabling it to be more compatible with all internet-ready devices, including desktop computers, laptops, mobile phones, and tablets. This advanced design automatically adjusts the website layout and navigational menu according to the screen size of the device used to view it, ultimately creating a more aesthetically-pleasing experience with enhanced usability for the viewer. 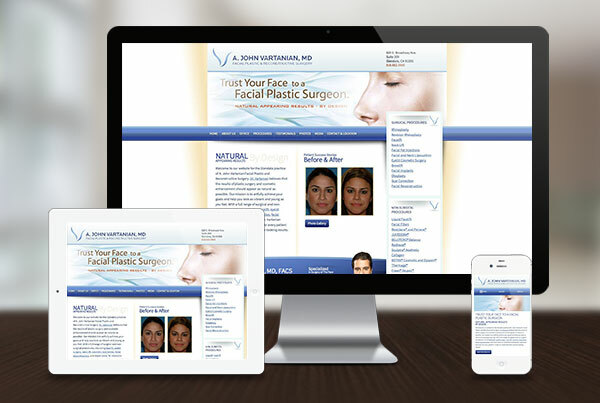 To view an example of the type of unique, responsive website design Rosemont Media can create for your practice, please visit www.facial-plastic.com.